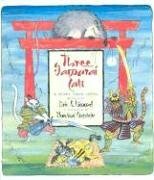 This book seams to be a cute Japanese fairytail about a evil rat and three samurai cats. This book is on it's way to England! Have lent to my boyfriend while the book waits in mount tbr. Finally got this back from my boyfriend. He said he thought it was alright and that he liked the illustrations. Book has gone back in it's place in mount tbr. The best thing about having a niece, is that I can read picture books without shame! Because I quite like books with pictures in! I liked the story of Three Samurai cats. Loved the quote at the end "Draw Strength from stillness. Learn to act without acting. And never underestimate a samurai cat. Especially when he is old and you are a rat who likes rice balls." The illustrations are okay but not to my normal taste. I confess that I have twice read this to my niece but she has been sleeping both time, I just wanted to read it. This is one I will keep and read to her when she stays awake for longer. I actually gave this away a few years ago but it's currently living at my parents house. They turned my old room into a playroom for my nieces and this book is in the bookcase there.